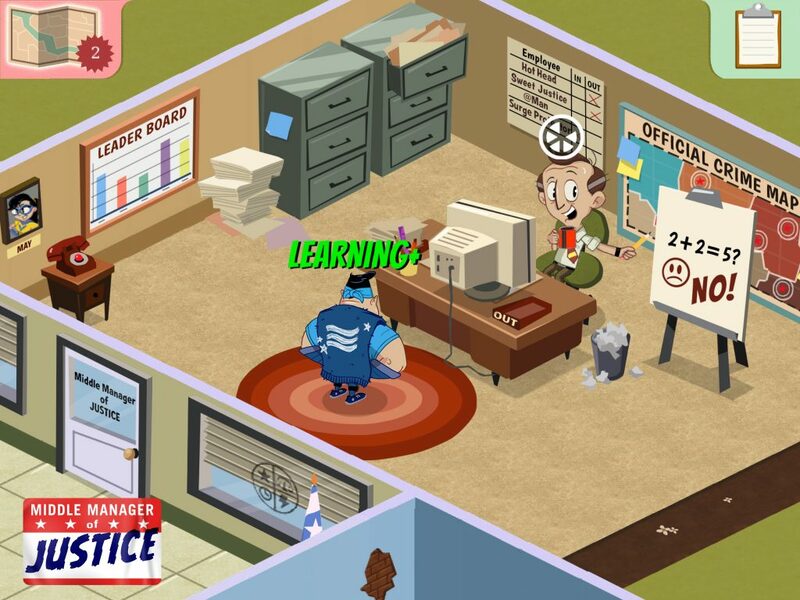 Double Fine Productions—the studio known for Psychonauts and Brutal Legend—had an old mobile RPG and manager called Middle Manager of Justice (Android) that I just discovered recently. How I passed this game I’ll never know because it’s a true gem. 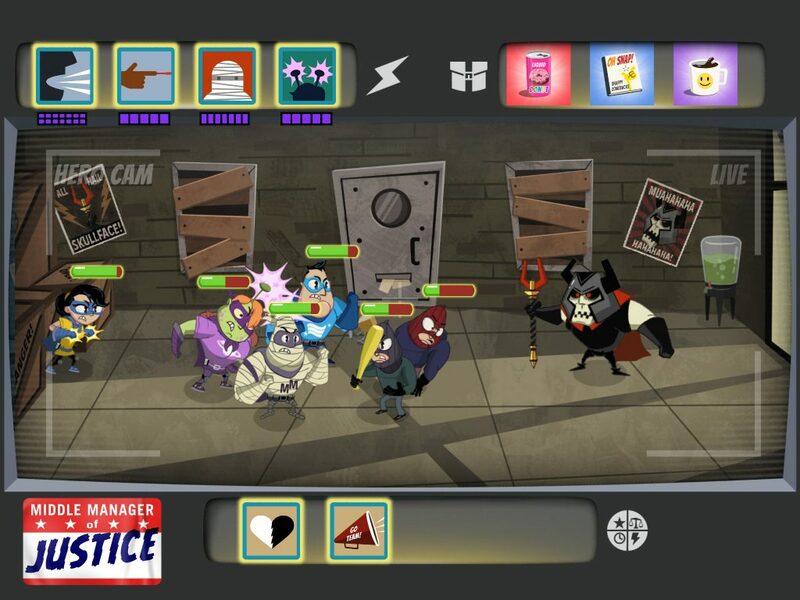 The premise of the game is that you take control of the Middle Manager of the 42nd franchise of a superhero team. Yes, you’re basically the manager of McSuperman’s newest store. The building you start with is pretty run down and your goal is to get it up and running. Justice Corp has given you just enough cash to start up the franchise by signing low level, rookie heroes. 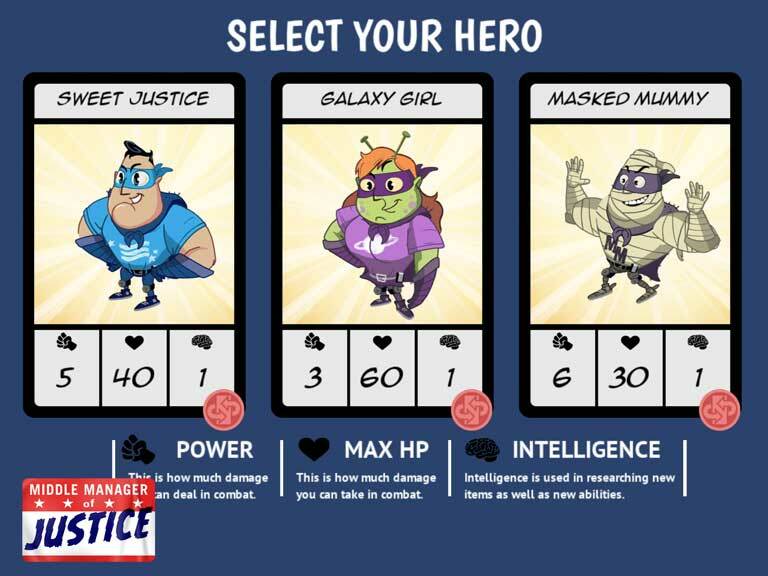 From there you can build these heroes up by training them and developing new powers and costumes. To do all of this, you’ll need cash and in RPGs that typically means you need to go out and battle enemies. 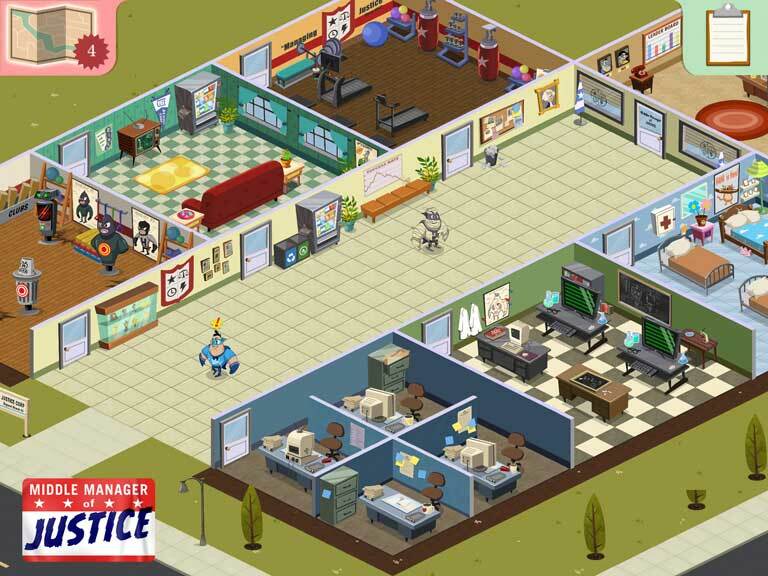 In Middle Manager of Justice that means going out and stopping crimes—mainly henchmen and thugs. You’ll get money from these battles as well as kind of fee for that district being crime free. Each battle in a district typically leads up to your team getting more evidence about the supervillain or criminal mastermind in the area and facing them in a boss battle. Once you have enough money, you can buy exercise equipment to train your heroes, rooms for different purposes such as relaxing, resting, research, and building things. There’s a second kind of currency you can use to speed up activities or sign superheroes. This currency is often replenished via victory in boss battles. Your heroes have three attributes for power, intelligence, and stamina (health) as well as a power bar for their moves. You can train the attributes and while each one is useful in battle, they are also useful in non-battle situations like stopping a runaway school bus or saving citizens from a fire. The difficulty in the game isn’t too challenging. As with any RPG, things get easier the more time you put into developing your team. If you’re impatient, you can buy in-game cash and such with actual currency. The other bright point for this game in addition to the gameplay is the comedy, a trademark of Double Fine titles. From the overall concept of a middle manager for a superhero team chain to the characters’ names to the banter, it’s all extremely funny.